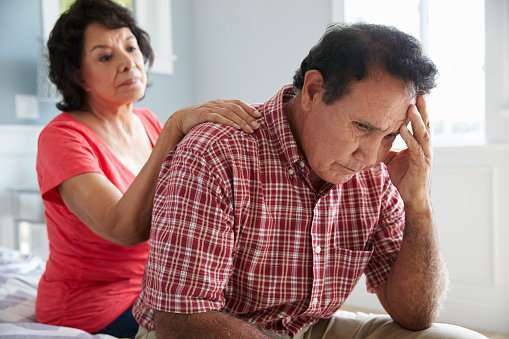 Atrial fibrillation patients who are diagnosed with carotid artery disease face higher risks for developing dementia, according to new research from the Intermountain Medical Center Heart Institute in Salt Lake City. Blockages in the carotid artery, which gradually build up as people age, restrict blood flow to the brain. The new study shows that a combination of the two diseases and the resulting impact on blood flow significantly increases a patient's chances of developing dementia. Prior research has shown the abnormal heart rhythms of atrial fibrillation produce inconsistent blood flow to the brain, which contributes to the onset of dementia or a decrease in cognitive function. Risk factors are similar for atrial fibrillation and carotid artery disease and include age, weight, hypertension, high cholesterol, and diabetes. Smoking can also increase risk. "Our team of researchers has been studying links between atrial fibrillation and dementia. This new data stresses the continued need for physicians to monitor and screen patients for both carotid artery disease and atrial fibrillation, especially patients who have risk factors of either disease, said Victoria Jacobs, Ph.D., a clinical researcher with the Intermountain Medical Center Heart Institute." Results of the study will be presented during the Heart Rhythm Society's 39th annual Scientific Sessions in Boston on Friday, May 11. More than 200,000 new patients are diagnosed each year with carotid artery disease, which is caused by plaque building up in the artery that leads from the brain to the heart. However, the disease is usually asymptomatic until the patient has a stroke. The largest age group of people affected are those over 60. Atrial fibrillation, the most common heart arrhythmia in the world, affects more than 2.7 million American adults. The abnormal heart rhythm causes blood to pool and clot in the heart, and when those blood clots break free, they can cause a stroke. Researchers examined 6,786 patients with carotid artery disease with no history of dementia, and compared those in the group diagnosed with atrial fibrillation to those with no diagnosis of atrial fibrillation. The average age of the patients was 71.6 years old and 55.6 percent of them were male. Twenty one percent of them had atrial fibrillation. How can study results help providers and patients reduce the onset of dementia? Dr. Jacobs says early awareness and recognition are key. "Atrial fibrillation and carotid artery disease are treatable, and addressing those diseases early on can help reduce the risk of developing dementia," said Dr. Jacobs. "Physicians should be discussing the treatment options with patients who are at risk to help educate them about what they can do to live the healthiest life possible. Patients should be engaged in their own healthcare, knowledgeable about their risks, and active in maintaining healthy lifestyles. Neither disease should be accepted passively, because both are treatable, and treatment is especially important given the benefit of helping to prevent or postpone dementia." Researchers will continue to analyze the data to compare it among different groups to see what patterns may exist in identifying a patient's risk of developing dementia.